Crown Prince Haakon, Crown Princess Mette-Marit and some top Norwegian officials will likely need to deal with some critics when they visit a few controversial Norwegian-controlled businesses in Chile next week. The royal couple's official visit to Chile is meant, in part, to highlight and drum up new business ties between Chile and Norway. The local population, however, isn't altogether happy with at least two of the businesses already there. 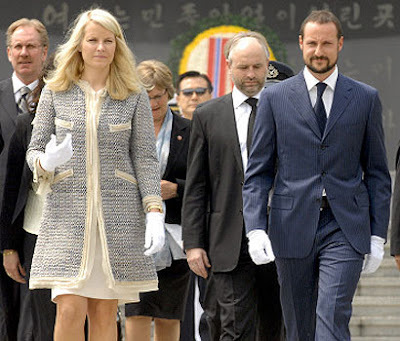 Crown Prince Haakon and Crown Princess Mette-Marit are due to visit, for example, Marine Harvest. It's the world's largest seafood producer, controlled by Norwegian tycoon John Fredriksen, but it's been under attack by labour leaders both in Chile and Norway. They claim Marine Harvest maintains poor working conditions for its employees and threatens them against joining labour unions. Norway's trade union congress LO released a critical report this week on both Marine Harvest and another Norwegian seafood producer, Cermaq, that it has forwarded to the Norwegian Foreign Ministry. Marine Harvest has been having problems in Chile and logging losses, not least because of illness among the salmon it farms. Both wild salmon advocates and environmental groups have claimed that Marine Harvest's farming methods aren't environmentally friendly. "Norwegian seafood companies come to Chile and do things they'd never get away with at home," said Dave Bard of the National Environmental Trust's Pure Salmon Campaign in Washington. Stefan Woelfl, a scientist at the Austral University of Chile in Valdivia, has conducted numerous studies of the region's lakes to determine the environmental impacts of salmon farming, which he described as serious. "But if I find problems in a lake, I don't direct my complaints toward the company -- I direct the complaint to the government," Woelfl said. "The company didn't do anything wrong according to the law. It's the state that is allowing it to happen." Marine Havest officials have bashed the LO report, calling it "misleading" and full of "undocumented claims." Company spokesman Arne Hjeltnes said Marine Harvest has a "tight dialogue" with its labour organizations, and welcomes cooperation with them (so long as they don't demand improvements?). LO defended the report, saying it was based on many interviews with sources in Chile. Meanwhile, another company owned by the state is also under fire in southern Chile. SN Power has sparked the anger of native groups over its planned construction of a hydroelectric plant. Company officials and Norway's government minister in charge of business and industry, Dag Terje Andersen, expect to meet criticism when they appear at the companies and participate in a seminar on fish health. It remains uncertain whether they'll also meet formal protests or organized demonstrations.